You will have undoubtedly seen it by now – but for some reason not on this site yet! 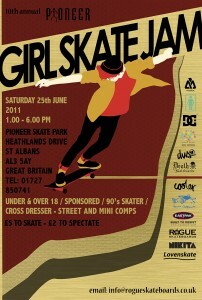 – the poster for the Girls Skate Jam 2011. Now in it’s 10th anniversary year and organised by SkaterGirl author Jenna Selby, the comp will of course be happening at Pioneer Skate Park on Saturday 25th June between 1 – 6pm. There will be the usual comps: Under 18, Over 18 and Sponsored in Street and Mini – but as part of the decade celebrations there will also be a 90’s Girl Skater section (Dress up in the good old baggies, with dog chains etc) and a Cross Dresser section for the guys. Nikita will be hosting the BBQ and you can check out the facebook event page here.